Check out the SoundGuys Podcast on iTunes! This episode “Spooky Audiophile “Ghost” Stories (That People Still Believe)” can be downloaded here. Below is a full transcript of the podcast. Be sure to subscribe to iTunes for more episodes! Imagine, if you will, another dimension, one where verifiable fact is replaced with arguments between extremely passionate people. Where science and math are replaced by wine review critics, and no piece of audio gear is ever enough to live with for more than a month. You’ve just entered into… the Audiophile Area. Okay fine, they just rebooted Twilight Zone again during recording of this episode and I had to be extra careful about copyright, so just… okay? Alright? Just… yeah.. kay? 2008, United States of America. Several companies including Monster Cable and Radio Shack releases high-end gold-plated interconnects and speaker wires at a premium price. Well, who wouldn’t want their equipment to be top of the line? Surely, using better materials for a luxury product would result in better audio? Testing this theory seemed simple, by putting together a crack team for a double-blind listening test, the Monster cable was pitted in combat against the twisted remains of four wire coat hangers soldered together. Everybody thought they could hear the difference between the two. Alas, no man, woman or child could tell the difference. Everyone, was wrong. This one’s a classic, and we often joke about it at work, but the underlying science is pretty simple. If a speaker wire is a normal length, the benefits of extra shielding and expensive materials aren’t really going to matter all that much — not in a way you could hear, anyway. You don’t need gold or palladium, and you definitely don’t need to pay thousands of dollars for an insane amount of cable insulation to get good results from your speakers or headphones. The only thing that an exorbitantly expensive cable potentially affords is better construction quality. If a “premium” cable makes your music sound better than a cheap-o alternative, well, it’s because the latter is broken or frayed due to durability issues. The rest is all hogwash. As long as your cables can transmit the appropriate signal, your headphones or speakers will be able to reproduce that sound with imperceptible distortion. What you do need is an adequate amount of power, and appropriate equipment to handle the job. And nowadays flagship phones like the LG V40, which features an integrated 32-bit Hi-Fi Quad DAC, are able to handle this. So, we’re not faced with the same kind of problem it was back in the ‘70s and ‘80s. Chris has our next tale lined up, so I’ll throw it back to him. This is Mr. John Q Musiclover, age twenty-eight, a practicing audiophile who writes very intricate and detailed reviews for enthusiast forums and the like. He’s single, and with few friends in his hometown, his only cohorts zealots and acolytes to the devotion of posh sophistry—all separated from John by the glow of a computer screen. He has no passions minus whatever DAC or amplifier he lusts for. His life holds no purpose except to focus his wrath on phantoms that he believes live in his machines, chasing ghosts no human can see, feel, or hear. In short, Mr. John Q Musiclover is a tortured soul, who is haunted by the cruel ghost named Jitter. Okay, so we poke fun at audiophiles often here, but one major thing that needs addressing is the constant search for better equipment. Probably the most egregious example of this is the quest for better digital to analog converters — otherwise known as DAC chips — and amplifiers. However, much of the electronics behind these items have been solved for a long time now. Their performance far exceeds human perception, and even some of the measurable flaws they can sometimes exhibit are far outside the realm of audibility. For example, one of the more out-there flaws is called jitter. When you listen to super old cassettes or vinyl, you may hear a pitch-shifting going back and forth over the recording. That’s sometimes referred to “wow” or “flutter.” It’s an extreme example of what we’re looking for here. Timing errors in sample rate can create little warbles and frequency shifts in certain notes, especially if the equipment is of poor quality. However, that’s only possible in the highest of the high notes in modern chips, and pretty much no commercially available DAC chips are capable of affecting your music in a way that’s perceptible in humans above 22kHz in the most extreme examples. Let’s experiment on YOU now as our test subject. 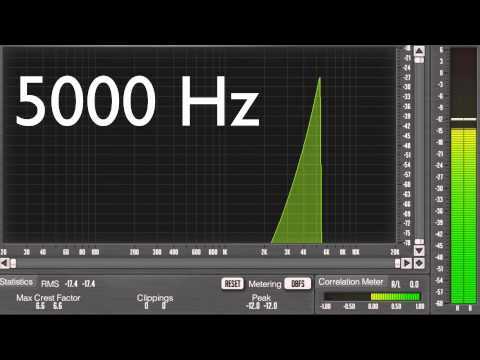 I’m going to play a frequency sweep at exactly the same volume across all frequencies. Let’s see what the highest note you can hear is, and I’m willing to bet it’s not as high as you think. Did the rising sound ever get super quiet or muted altogether? Congratulations! You can’t hear those sounds! Therefore, you need to stop worrying about them, because you are incapable of hearing jitter from a modern sound system unless it was added in on purpose! See? Sometimes it is just all in your head. Two contestants enter the ring—In one corner a set of headphones; in the other, one young person with a wallet that’s a few hundred dollars lighter than it was yesterday. And the game? It happens to be the historical struggle between paranoia and plastic, between the fears of those unaware and the product of modern manufacturing. Who will win? What will happen in the hours it takes for the speakers to heat up? How will we know? This bout is one for the ages, here in the Audiophile Area. Time…. is an illusion here. Something mankind has created to make sense of the ever changing world around them. But what happens when you remove time from the equation? When you separate space, from its natural partner? Well in terms of headphones, nothing. The myth that you need to leave your headphones playing for hours at a time in order to “break them in” (notice my audio air quotes) isn’t a thing. The argument here is that the components that make up your headphone drivers will become more responsive to the signals they receive as they get slightly worn down by repeated usage. Kind of a like a baseball mitt, where the brand new glove needs to be used constantly and folded up so that it’s easier to handle and more responsive to your fingers. And while it’s true that the more you play your headphones, the more that the driver’s will lose their rigidity, the results aren’t anywhere near as drastic. In fact, a lot of the so-called “evidence” for this theory come from charts where the burn-in effect is shown to have an effect of less than 1dB. Which, sorry to break to you, is all but imperceptible to our crappy human ears. You know what plays an even bigger, an more important factor in how your headphones sound? The earpads you’re using. It might seem overly simplified, but the simple obvious answer is usually correct. When you hear hoofbeats, you think horsey. Not zebra. Though it could be a zebra (or in this case the components on your headphones needing to be burned-in), it’s more likely to be a horse. Unless you’re..at the zoo or in the savannas of Africa. The way your ear pads handle isolation on your ears has a way bigger effect on how your music sounds. Over time, the ear pads mold a little better to your ears forming a better seal. At least until you wear them down completely. But in those bliss moments of seal perfection, you should thank your ear pads instead of burn-in. Thank you horsey. The tools of music do not necessarily come with fanfare or magic. There are phenomena that are simply feelings, attitudes, preconceptions – to be found only in the imagination of human beings. A mindless panicked investigation for sonic boogeymen has consequences of its own – for consumers – and the enthusiasts yet uneducated. And the worst part is that these things cannot be confined – to the Audiophile Area. That’s it for us here at SoundGuys, thanks for indulging our halloween special! If you want to know more about audio, or just want some droning voices to drown out the trick or treaters, be sure to like, comment, and subscribe wherever you get your podcasts. We release a new episode once a month, sometimes two, and we also cover the audio industry on our site SoundGuys.com. Be sure to reach out to us on Instagram, Twitter, and YouTube if you’d rather be entertained, and definitely don’t miss out on our giveaways every month. From all of us here to you, spooky listening!